In Another Serving of Irving Berlin, Jennie Litt and David Alpher are joined by folksinging cantor Bob Cohen (featured on the original recording of "Blowin' In The Wind" with the New World Singers). Another Serving is a glorious brew of songs by the Lower East Side immigrant waif, born Israel Baline, whose mania to assimilate culminated in his writing our "unofficial" national anthem, "God Bless America." Jennie, David, and Bob present known and unknown Berlin gems, from "Alexander's Ragtime Band" to "All Alone," as well as dialect songs ("They Were All Out of Step But Jim"), vaudeville novelties ("Cohen Owes Me Ninety-Seven Dollars"), waltzes ("Always"), Broadway hits ("I Wonder Why (You're Just In Love)"), and "sob ballads" ("Reaching For The Moon"). Jennie and David's elegantly comic theatricality contrasts excitingly with Bob's infectious and embracing singalong style; Jennie and Bob also join forces for a series of delightful duets. These three Berlin aficionados intersperse their musical offerings with insightful, informative commentary you won't find in any biography. Song list available on request. ...Turns out a number of high-level Berlin collectors and those who have mastered the art of interpreting his songs are in our midst. Not long ago, Chris Evers, who runs Our Bookshop in Saugerties, came across four boxes of Berlin's sheet music, including a number of rarities, and passed them on to ... Cantor Bob Cohen and cabaret duo Jennie Litt and David Alpher. Then result will be Another Serving of Irving [Berlin]: A Cabaret Evening of Berlin's Buried Musical Treasures. "Bob Cohen's quiet," wrote Bob Dylan in the liner notes to the 1962 folk album, The New World Singers (Atlantic). "I first seen him at a City College folksong hall an' thought he was some sort of a Spanish gypsy by the way he wore his sideburns an' moustache an' eyebrows — but he didn't talk so I couldn't tell — I musta sat an hour next to him waitin' to hear some gypsy language . . . I seen him sing later that night an' it didn't bother my thoughts no more as to if he was gypsy or gigolo — he tol' me more about my new world in that ten minutes time than the pop radio station did all that week". Singer, songwriter, multi-instrumentalist, cantor, and music educator Bob Cohen has been sharing the joy of music for five decades. His musical career first kicked into high gear in the early 1960s, when he joined The New World Singers, a folk ensemble that some thought might one day inherit the mantle of the Weavers. Fellow folkie Bob Dylan was inspired to write "Blowin' In The Wind" after hearing the New World Singers' live version of the spiritual "No More Auction Block For Me" at Gerde's Folk City in Greenwich Village. The New World Singers were the first to record the Dylan classic on their eponymous 1962 album; the recording was reissued in 2000 on the Grammy-nominated The Best of Broadside 1962-1988 (Smithsonian Folkways). Activists as well as musicians, The New World Singers traveled to Edwards, Mississippi, in 1962, where they led freedom song workshops for the civil-rights community. Bob returned to Mississippi during the Freedom Summer of 1964, when, as director of the Mississippi Caravan of Music, he played and sang all over the state at Freedom Schools, church meetings, and rallies, as well as bringing Pete Seeger, Judy Collins, Phil Ochs, and other musical luminaries south to support and inspire civil rights workers. Along with other movement veterans, Bob appears in the soon-to-be-released documentary Freedom Songs, discussing the role of music in the civil rights struggle. During the 1970s, Bob focussed his musical activities in the classroom, teaching music to kids at New York City's Little Red School House, the United Nations International School, and the Bank Street College of Education School for Children; he also taught Bank Street's adult degree candidates. On weekends, he sang, spun records, and bantered via on-air telephone calls with listeners on his early-morning show on WBAI-FM, New York City's beloved independent radio station. In the 1990s, Bob began a spiritual quest. After relocating to the Hudson Valley, he returned to the airwaves with Godyssey, which featured Bob and guests singing and playing folk songs, songs for the seasons, and originals. Godyssey ran for five years on Kingston (NY) public-access TV. Since 1998, he has served as Cantor at Kingston's Temple Emanuel. For over a decade, Bob has been touring the east coast entertaining seniors with his unique brand of participatory music-making, accompanying himself on guitar and piano. His repertoire encompasses Tin Pan Alley favorites of the 1910s through the 1940s, as well as a hatful of songs in Yiddish, Russian, Spanish, Ladino, Romany, Croatian, Macedonian, and Korean. His CD, They Ain't Writing Them Like They Used To, captures his act's warm high spirits. Another CD, Singing Prayers For A Sabbath Eve, with Bob on piano, guitar, accordion, autoharp, and vocals, includes traditional settings of prayers by Sulzer, Lewandowski, and Binder, as well as his own original settings, and contemporary settings by Debbie Friedman and Craig Taubman. 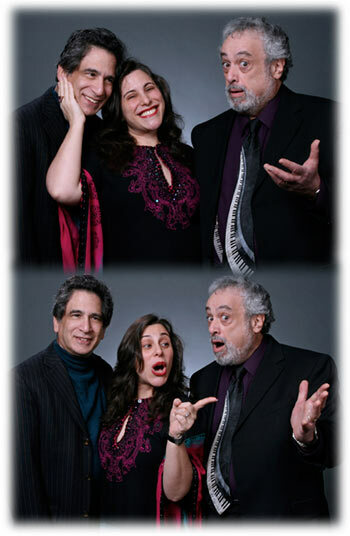 Bob's program with cabaret duo Jennie Litt and David Alpher, Another Serving of Irving Berlin, won a Kol Isha Award from the Women of Reform Judaism.